We spent two weeks at the Jersey Shore and I'm ready to find a way to be able to spend my entire summer there. The slow relaxed pace, the easy biking opportunities and the great farmers' market food finds all made for a wonderful vacation. Whoever said there isn't good food at the shore was wrong. You just need to know where to look and what to do with it once you find these hidden feasts. The number one key to locating the food finds at the South Jersey Shore towns, like in the areas where we vacationed, Ocean City to Stone Harbor, is to know about the weekly farmers' markets. Fine dining may be a myth outside of Atlantic City, but decent honest food can be found every week in every beach community. Even on the boardwalk, where the usual fare, repeating block after block like some poorly drawn cartoon town scene, are boardwalk fries, soft serve ice cream custards, pizza pies as big as truck wheels and the occasional hot dog or hamburger shack. We managed to find a gourmet hot dog and a top notch taco shop, Pure Tacos, on the Ocean City Boardwalk, surpassing my taste expectations. As for restaurants, outside of the stronghold seafood joints, there are a fair number of places to eat a decent meal. We did a lot of breakfasts at Uncle Bill's, a South Jersey Shore classic pancake house, with establishments in Ocean City (2) running down to Cape May and all towns in between. Eating out at a restaurant is still near impossible with our imp, Nate, 2 1/2. Take out is a more logical option. When you vacation with family, especially grandparents, there's usually an opportunity for some baby sitting so the parents can have an hour or two for uninterrupted dining. We went to Mildred's in Strathmere, celebrating its 60th year in business. Very good Italian Food, served in manageable portions at decent prices. It's the kind of old world Italian American Shore Restaurant that still offers the entree with a soup or salad and two vegetables or pasta as a side. If it were a diner, we would have had our dessert choice included with the price! Very good food, fast, clean, and you get roasted peppers and bread with each meal! The Pie Girl's Blueberry Cobbler - AMAZING! The real food finds where at the abundant farmers' markets that were operating nearly every day of the week in one town or another. 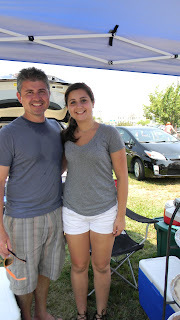 We hit the Sea Isle Farmers' Market located in the town center on Tuesdays and on Wednesdays we drove 5 miles into Ocean City and went to the market at 6th and Asbury. The Sea Isle Market was lively, filled with good produce, crafts people and a calypso beat thanks to either piped in music or a DJ. I didn't find anything extraordinary, though I wasn't looking for the best finds, just the best produce. The market in Ocean City provided us with all the best finds, Pies by the Pie Girl; Gilda's Biscotti; Momma's Homemade Apple Garlic Hot Sauce; Tony Baloney's Flat Bread Foccacia Pizzas; Coffee Talk Smoothies; homemade pickles. We could have filled another car with all the goodies the OC Market had for sale! By far the best find, on so many levels, were the pies and treats by The Pie Girl, Cat Gleason. I could cry and smile about this young woman's story. 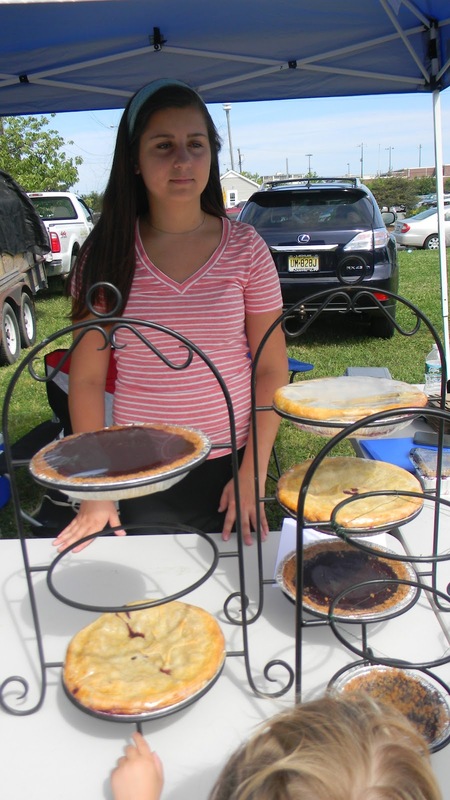 The Pie Girl is a 15 year old high school student from Ocean City, who bakes about 100 pies a week, in the church kitchen at St. Peter's Methodist Church. She sells her pies every Wednesday at the OC Farmers' Market and donates the proceeds to St. Peter's to help feed the homeless and the hungry. Her motto is, "One pie at a time". There was a recent article about her in The Press of Atlantic City as well as some other local press and a mention in the St. Peter's Church Bulletin. She's a remarkable, poised young lady, a rare find these days. We chatted with Cat on our first visit to the market, and I couldn't wait to go back the next week to buy another pie and to talk further with her. We were smitten with her loveliness, her well turned out products and the mind-boggling goodness of her blueberry cobbler. The first week we bought 2 items, a chocolate pie with a graham cracker almost Heath-Bar like crust and the aforementioned blueberry cobbler, that had a sweet brown sugar and graham cracker streusel and crust. The first week she was friendly and open to talking but we really connected the second week, once she recognized me and I told her that I wanted to take some photos, blog about her and know more about her business. 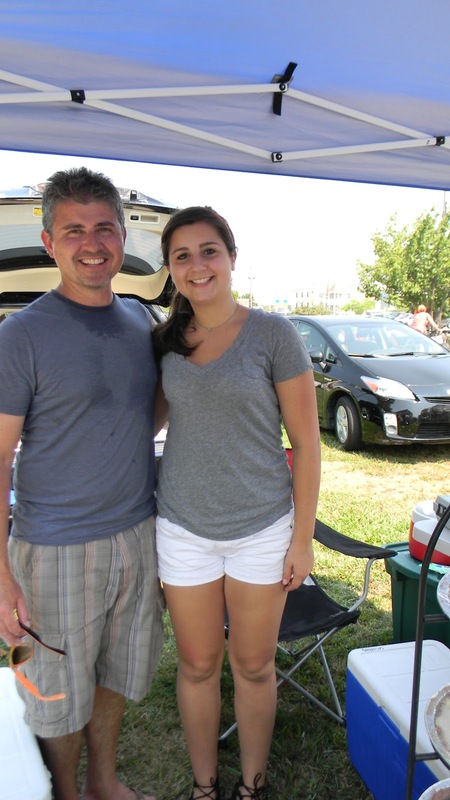 Her dad, Rob, was just as warm and friendly, selflessly promoting all his daughter does, her hard work, her labor of love and the fact that she's donating all of the proceeds to charity. When I told him that he deserves some credit too, for his hard work and his excellent parenting, he still demurred! They both were happy to have me take their photo; I really wanted to get them both as I thought that there is a wonderful spirit to the two of them and it really comes through when they stood together. Even though it was a horribly hot day, the whole operation was doing a brisk business, working at full capacity, with a few helpers of friends and family members. Most of The Pie Girl's baked goods were gone by the time we made it to the market mid-morning. We bought a tart and tangy key lime pie, which was devoured by our family in no time, and a few pie pops - little mini pies on lollipop sticks. Nate enjoyed those a lot! Cat, her dad, Rob and I talked a bit about her business, her future plans and dreams and about working in the restaurant and food business. I told her that my dream is to open a pie shop and she agreed, that is what she wants to do too. I told her that it's great that she's doing this now, working her way up while she's young. She'll get the best experience and learn the most while she's still able to enjoy the grind without it feeling like a grind. Her dad was most interested in a shop I told him about that is planning to open in Philadelphia on South Street, called Mag Pie, a sweet and savory pie cafe. If Cat keeps going at the pace she's working, she may well exceed her goals of helping the hungry and homeless one pie at a time, giving St. Peter's Methodist Church more than the $1,000 she hopes to donate for July. She may, and I truly hope she does, open her own shop by next summer, feeding many souls one pie at a time. Food finds and inspiration at the Ocean City Farmers' Market. Blessings all around. If you are down the shore, in or near Ocean City New Jersey, make a point to stop by the market on Wednesday, from 8 am to 1 pm. Tell her I sent you and make an extra contribution to her cause. Her pies are as wonderful as she is, and she's lovely!